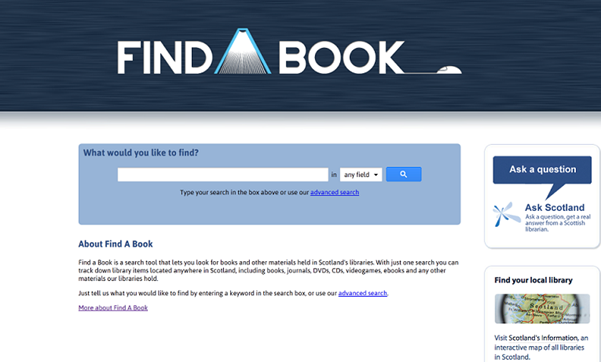 Find a Book (http://www.findabook.org/) is the successor to CAIRNS (the Co-operAtive Information Retrieval Network for Scotland) which enabled simultaneous searching of SCURL (Scottish Confederation of University and Research Libraries) members’ catalogues. It later grew to include non-SCURL members’ and public library catalogues allowing users to search across 42 Scottish library catalogues in total. CAIRNS used z39.50 and was difficult to implement and labour intensive to maintain across so many institutions and local authorities. It was also slow to return results, latterly taking up to 20 minutes to complete a search. This was far from ideal when users expect Google-like speed from web-based services. Nevertheless, despite its flaws, CAIRNS had a loyal user base. However, no data is available to determine who used the service and in what way. In late 2011 SLIC (The Scottish Library and Information Council) made the decision to replace CAIRNS. Following a formal procurement process, SLIC selected the open source, integrated search product; ‘rebus:connect’ supported by PTFS Europe, as the system to deliver ‘Find a Book’. SLIC will gather data using Google Analytics to provide an informative picture of who is accessing Scotland’s collections. While Find a Book awaits its official launch, the service is currently available and, in line with the design brief to be accessible to any member of the public, provides users with a simple and familiar single search box interface to search across 50 National Library, Academic Library and Public Library catalogues. It’s quick and easy to use and allows users to select to search by sector. Notably, FE College libraries are missing from the list of searchable catalogues. SLIC found a large number (75%) to be embedded in VLEs and, therefore, incompatible with the screen scraping technology used by rebus:connect. However, work to include FE College catalogues will commence in 2013. Find a Book will allow you to do just that, but once you’ve found the book, there is still the question of accessing it. There are 32 local authorities in Scotland and, generally, you must live or work within the authority to be eligible to use the library service. Find a Book tentatively addresses the issue of access in the site’s FAQs. However, it will be interesting to observe if, and how, users’ expectations have changed since the launch of CAIRNS in 2006 and if ‘finding’ is only the first inevitable step in providing shared access to Scottish Collections. It is worth mentioning here that there is a comparable service in Ireland called, Borrow Books (http://www.borrowbooks.ie/) a public library initiative which allows users to search across Irish public Library catalogues and, request books online via Inter-Library Loan. Making further use of the National Entitlement Card with services like Find a Book may be where additional benefits emerge for Scottish users. Funding has been exhausted for the initial project, making promoting the new service a challenge. The challenge is compounded by the lack of one definitive location from which to promote Find a Book. Despite being a service primarily aimed at the public library user, there is no mandate for local authorities to embed links to the service on their websites. Initially Find a Book will be accessible from the SLIC sites; Scotland’s Information (http://www.scotlandinformation.com) and the Virtual reference service: Ask Scotland (http://askscotland.org.uk/ ) to provide a consistently branded Scottish information service.